This three bedroom detached house offers a great deal of family requirements with spacious, bright and open plan accommodation together with a three year old conservatory leading out to the good size flat rear garden. Located in a super location with schools and amenities nearby. The property is pleasantly situated within this cul-de-sac of modern detached and semi detached houses.Crowborough town itself provides an excellent range of shopping facilities including a bank, post office, doctors, dentists and supermarkets including a Waitrose and Morrisons together with an array of independent shops and retailers. The main line railway station at nearby Jarvis Brook provides trains to London Bridge in approximately one hour and benefits also include a good selection of bus routes. The area is well served for both state and private junior and secondary schooling with sporting and recreational facilities including golf at Crowborough Beacon and Boars Head courses, Crowborough Tennis & Squash Club and the Crowborough Leisure Centre with indoor swimming pool. Located to the west of Crowborough is Ashdown Forest which is a great place for walking, riding and enjoying spectacular views over the Sussex countryside. The spa town of Royal Tunbridge Wells is approximately eight miles to the north where you will find the mainline railway station, good range of grammar schools and an excellent mix of retailers & eateries spread through the Pantiles, The Old High Street and Victoria Place Shopping Mall. The coastal towns of both Brighton and Eastbourne are situated approximately one hours drive away and Gatwick Airport can be reached in approximately 45 minutes drive. DOWNSTAIRS CLOAKROOM: Low level wc, wash hand basin with tiled splashback, wood effect laminate flooring, radiator, obscure double glazed window to side. CONSERVATORY: Wood effect vinyl flooring and French doors lead out to the patio and garden. KITCHEN: Range of high and low level units with granite effect work tops, one and half bowl stainless steel sink with mixer tap, spaces for a washing machine, fridge/freezer and dishwasher, Newhome fan assisted oven with 4-ring gas hob and extractor above, concealed wall mounted Ideal boiler, radiator, wood effect laminate flooring, double glazed window to rear. 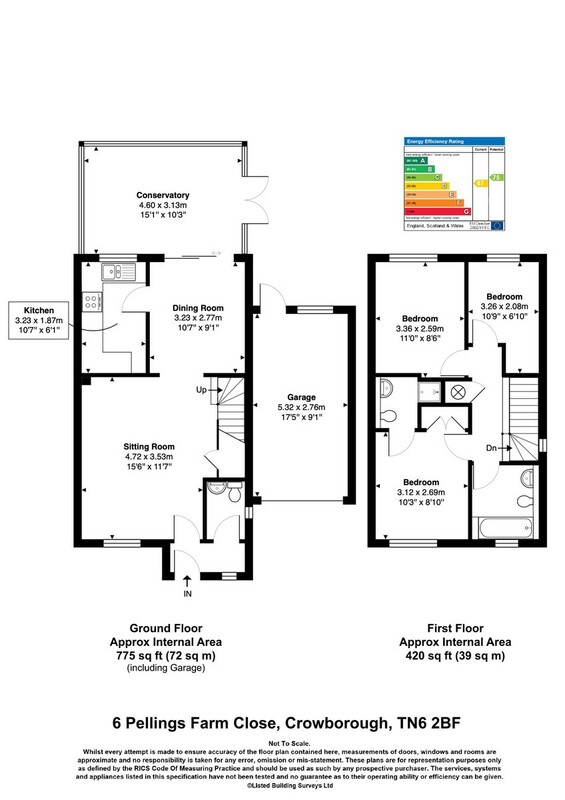 EN SUITE: Fully tiled shower cubicle with Aqualisa shower and glass screen, low level wc, wash hand basin with mixer tap, ladder style towel rail, extractor fan, tiled flooring and tiled walling, obscure double glazed window to side. BEDROOM: Fitted carpet, radiator, double glazed window to rear with fitted blind. FAMILY BATHROOM: Panelled bath with mixer tap, low level wc, wash hand basin with mixer tap, part tiled walling, tiled flooring, extractor fan, ladder style towel rail, obscure double glazed window to front. OUTSIDE: To the front of the property is an expanse of lawn with various planting, off road parking leading to the garage with up/over door and currently benefiting from electrics, pitched roof ideal for storage and a double glazed door and window to the rear garden, wooden gate with side access to the rear garden. To the rear the garden is predominately laid to lawn with mature planting, paved patio ideal for outside entertaining and surrounded by wooden fencing.